Known for his vibrant books, struck with great colour and design, Paul Thurlby's latest offering had my heart pitterpattering all the way to the post box. And pitterpattering all the way home again. This is a gorgeous creation. 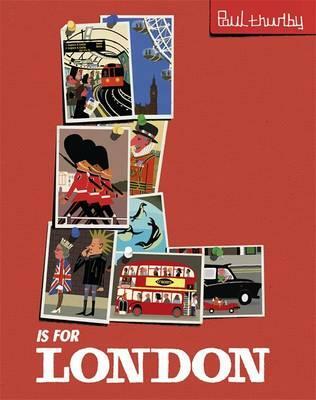 Reminiscent of the great Miroslav Sasek in colour and style, Thurlby has put a timeless spin on his divinely-rendered illustrations, in a book that showcases the inner workings of the great city of London, along with a lesser smattering of the more 'typical' tourist fare. 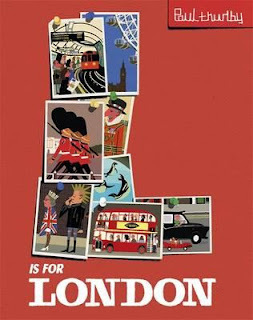 From the hand-clapping endpapers and London map in the opening pages, to the alphabetical listing of all things London, adults will delight in Thurlby's featured elements as much as kids. A is for Abbey Road, oh yes it is. And B is for Borough Market. F is for Foyles (hurrah! love that store!) and I is for ice skating at Somerset House. The book also includes St Pancras, Wimbledon, the Royal Guards--and how could it have been complete without the double decker bus? I love that this book will appeal to the tourist market, yes, but it will also appeal to locals and travellers and overseas culture vultures because of its depth of content, and its more idiosyncratic entries. From a nose-picking punk to a peek at the world's oldest scientific zoo, this is a journey you'll want to take time and time again. Thick, hard cover and lustrous, this book, my fellow picture book lovers, is a keeper.